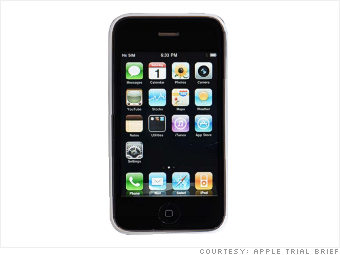 The iPhone was a game-changer when Steve Jobs announced it in January 2007. It was the first major touchscreen phone to reach the mass market, and its distinctive design made it an instant hit with critics and consumers. Apple's claim in the patent trial now underway in San Jose, Calif. is that Samsung ripped off the iPhone's "trade dress" -- its patented outer shell and menu design. Among the attributes that Apple says constitute the iPhone's legally protected innovations are "a rectangular product with four evenly rounded corners"; a flat, clear surface covering a display screen; and, when the device is on, "a matrix of colorful square icons with evenly rounded corners."